In conjunction with NAHB’s recent survey “What Home Buyers Really Want”, conducted by the Home Innovation Research labs in July 2012, we also found out what home owners and prospective home buyers are specifically not interested in. 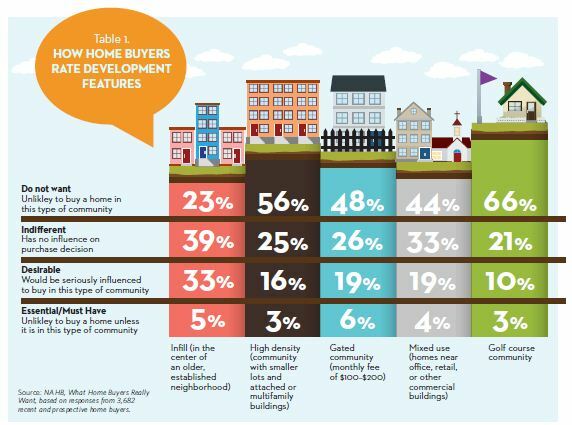 The survey listed five characteristics of a development or community in which a home was located, including: infill, mixed use, high density, a gated community and a golf course community. With the exception of an infill development, participants replied that they were not interested in living in any of these types of communities. Though these types of communities have been extremely successful in the past, this survey suggests that preferences are changing. Would you be interested in a home that is located on a mix use, high density, gated community or golf course community? Why or why not? Find out more in the Fall issue of Best in American Living.